What would it feel like if you open your package of beard trimmer and find Gillette flex ball in it? There is no need to put an introduction about Gillette’s fineness, brilliance and excellence in the industry ever since it started. If you are not familiar with the benefits of the Flex ball, let us explore about it in details. It has all the good qualities of a Fusion razor and it does not cause skin irritation. The pivoting head adjusts to the skin with every stroke you make. The blades are ultra-thin and cuts through hair with ease. Let us talk about the beard trimmer. It is similar to BT 3020 because it can take care of full beard, moustache, head stubble and goatee. They both have sharp blades that will last a lifetime. Their power is always constant. They look similar except the 3040 is blue in some areas while 3020 is fully black. Let us explore the differences. The 3040 being more advanced has 39 different length options with 0.5 mm increments. Some people find the 20 lengths in 3023 to be excessive. If you think that too many length settings are unnecessary than it is not a good choice. You can a Gillette Flex ball for free which you will not get with the other model. You can use this as a corded one as well so there is no reason to worry about charging it. The operation time is one hour which is 20 minutes more than the other one. The extra details and superb qualities of the device makes it so outstanding. There are many other brands trying to put up beard trimmers like this one, but this one better than the rest. It has the adjustable dial which lets you decide how far you want to be as of the guard. In that way, you can decide the length. Here you need only one guard for the job. You can wash the head which makes it low maintenance. The structure and design makes it stand out from other beard trimmers in the market. It has an ergonomic design and simple structure which makes it user-friendly. Since it is not waterproof, do not put it under water. To know how to maintain it properly, refer to the instructions manual. If you like going with a short beard, you should opt for this. 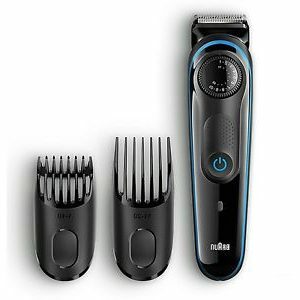 It can be the perfect replacement for your old trimmer. The tool can reach all the parts of your face. You can use this every day without having to worry about irritation or redness of the skin. The extra razor is a nice bonus. This entry was posted in Braun on January 3, 2018 by Professional Beard Trimmer Reviewer.